Obtaining financial success can require a large amount of time, advanced skill sets, and specialized knowledge. That’s what our Wealth Management Services are for. 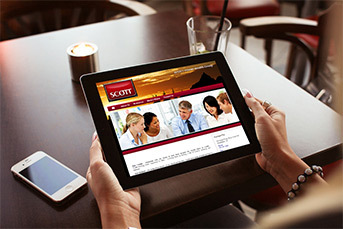 Scott Insurances wealth management team offers a large supply of services to meet your financial needs. We believe our name suggests our focus on specialized services, thus fully and precisely mirroring who we are and how we aim to serve our clients. Our services include individual and family financial, investment, retirement, and estate planning. At Scott, our advisors begin the financial planning process with a focused review about you, your values, and your current financial health. We take the time to understand your goals and dreams so we can create a plan to help move you in the direction of completing them. Securities and Investment Advisory Services offered through Cetera Advisors LLC. Member FINRA, SIPC. Scott M. Thomas is a Registered Principal and an Investment Advisor Representative of Cetera. Otherwise, Scott Private Wealth Group is unaffiliated with Cetera Advisors LLC. Call Scott Thomas at 800.997.0488 or via email at sthomas@scottprivatewealth.com.